Artemis Racing today won the fleet racing at the RC44 Virgin Gorda Cup, with a four point margin over Peninsula Petroleum, having led from the outset of the four day regatta. But while this was close, the outcome of the 2015 RC44 Fleet Racing Championship was closer, only decided in the last seconds of the final race, followed by some intense mathematics and the breaking of a tie. Torbjörn Törnqvist’s Swedish team put in a late charge this season, posting four bullets this week to achieve their first RC44 victory since the Austria Cup in 2012. The 2015 Fleet Racing season for the one design 44 footers became a two horse race between Vladimir Prosikhin’s Team Nika and Vladimir Liubomirov’s Bronenosec Sailing Team. 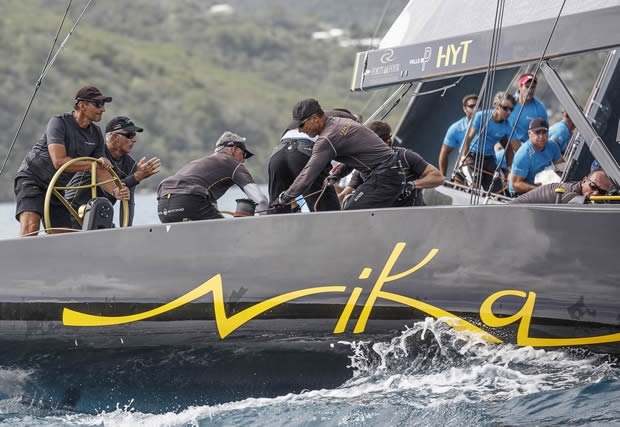 The two teams had either won or come second in the two previous events and, in the championship, Team Nika was one slender one point ahead of her rival going into the RC44 Virgin Gorda Cup. This morning in the Virgin Gorda Cup, Bronenosec was lying third, one place ahead of Team Nika, but needed another boat to finish the regatta between her and Team Nika to win the Championship. Initially this seemed all but impossible, but in today’s first race, the two leaders, Artemis Racing and Peninsula Petroleum, finished last. This left Peninsula Petroleum still second but now only three points clear of Bronenosec. This margin narrowed further to two points going into the day’s third and final race. Against the odds, at the final weather mark rounding of the deciding race, Bronenosec was in a Championship winning position: Leading, with Team Nika in second and Peninsula Petroleum in fourth. However on the last run a squall rolled over the fleet and with gusts of 30 knots on one side of the course and nothing on the other (where the leaders were), the positions were overturned. Ultimately Team Aqua and MAG Racing came home first and second respectively, but, importantly, Peninsula Petroleum was third, meaning she retained second in the regatta with Bronenosec Sailing Team and Team Nika still third and fourth. On the championship leaderboard this left this Bronenosec Sailing Team and Team Nika tied at the top, but with Team Nika claiming the title – the tie split through her having scored a better result at the RC44 Cascais World Championship. Cameron Appleton, tactician on 2014 RC44 Champion Team Aqua summed up: "It was a phenomenal year of racing, truly a hard season, a hard-fought win for Nika and huge congratulations. We know what it feels like and we're proud that someone else has sailed so well to accomplish what they did." The 2016 RC44 Championship Tour will be announced imminently, but will start in Bermuda and, for the first time, will visit the UK.